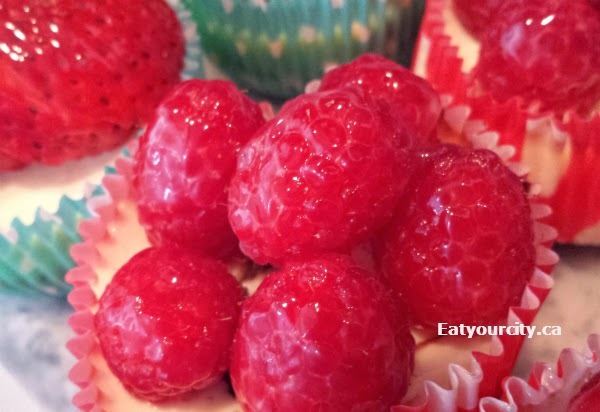 Eat Your City: Mini cheesecake recipe - New York cheesecake, Nutella swirl cheesecake, raspberry and strawberry topped cheesecake and fruit glaze recipe! Mini cheesecake recipe - New York cheesecake, Nutella swirl cheesecake, raspberry and strawberry topped cheesecake and fruit glaze recipe! Posted by I love summer. I love summer fruits. I hate bathing suit season... who doesn't? But I do love indulging with as little guilt as humanly possible! So when I had several bricks of cream cheese in my fridge begging to be used up.. it was mini cheesecake making time! Using cupcake/muffin tins to bake these mini cheesecakes not only yield cute little cheesecakes - the smaller portions will let you indulge without the bulge! :D And since these mini cheesecakes aren't as fussy as making a big cheese cakes - made several variations like New York mini cheesecakes, Nutella swirl cheesecakes, and of course, ones topped with fresh strawberries and raspberries lightly brushed with a clear fruit glaze... let go make some mini cheesecakes! When making big cheesecakes, you have to let the cream cheese come up to room temp, don't over beat, wrap up the spring form pan in someone water and oven safe, sit it in a water bath, let it cool for hours in the oven so the darn thing ins't lumpy, uneven, or cracks. With mini cheesecakes, you can chuck everything into a mixer and happily ignore all tricks you'd normally need to do with a large cheesecake. With mini cheesecakes, it doesn't matter if the mini cheesecakes sink a bit if they cool too quickly - you have more space to top it with fruit, chocolate, nuts etc! And since the surface area is much smaller on a mini cheesecake - it rarely if ever cracks as it cools... if it does, cover it up with a glaze, or toppings :) Plus, since it doesn't have to sit in a hot oven to slowly cool off, it never comes out dry! And yup, I'm using a super old school crappy muffin pan as well as a silicone heat resistant cupcake/muffin pan - silicone one gives me a nice straight up sides for prettier mini cheesecakes. You can make these mini cheesecakes all in one go - slice fruit and make the fruit glaze as the cheesecakes cool.. if you place cheesecakes in the fridge before they completely have a chance to cool, the condensation that forms may give you soft mushy graham cracker/oreo crumb bottom. Tossed them all in fridge after they cool as I was tired and it was midnight - fruit toppings go on tomorrow morning! Some of the mini cheesecakes I just served as is... the others I topped with freshly washed (and lightly patted down with paper towels) sliced strawberries and raspberries. Then lightly brushed with a clear fruit glaze to give it a pretty shine, keep the fruit from going mushy and its tasty to boot! Just don't drown your fruit in the glaze lol! I prefer New York style cheesecakes (addition of sour creme) - it gives the cheesecakes a lighter, fluffier texture and isn't as sweet as a regular cheesecake. If you prefer the straight up cheesecake, just don't add in the sour creme. 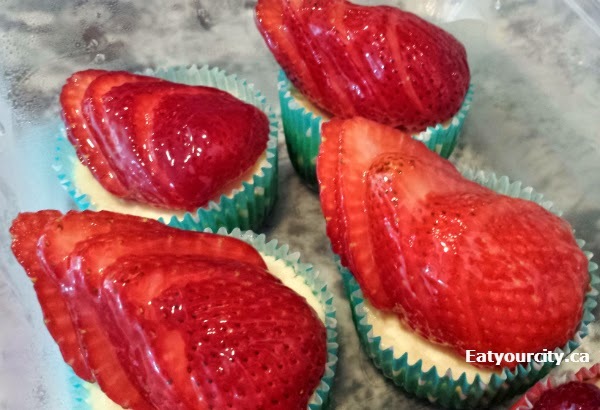 5) Bake for 5 minutes, set aside to cool - leave the liner filled cheesecake bottoms in the cupcake/muffin pans. 1) Using a mixer or if you feel like working out your muscles, cream the cream cheese sugar, sour cream and vanilla together until well blended. 2) Bring contents of pot to a boil - boil for about 2 minutes - the mixture will turn opaque. Be careful as sometimes the hot contents of pot will spit as it boils!